NASA marked the new year with a historic “fly-by” of a brand new world the space agency claims is the most distant object ever discovered by humankind. NASA’s New Horizons mission flew by the object, which has been dubbed ‘Ultima Thule’ and is located over 1.6 billion kilometres from Earth. The first image taken as the probe ventured as close as 27,000km to Ultima Thule was so blurred that it looked a lot like a bowling pin, but new images have since changed the team’s perspective. “Let me say that bowling pin is gone — it’s a snowman if it’s anything at all,” New Horizon’s principal investigator Alan Stern told media during a press conference this week. Further investigation of the object has confirmed that it is actually red in colour. “Never before has any spacecraft team tracked down such a small body, at such high speed, so far away in the abyss of space,” he said. 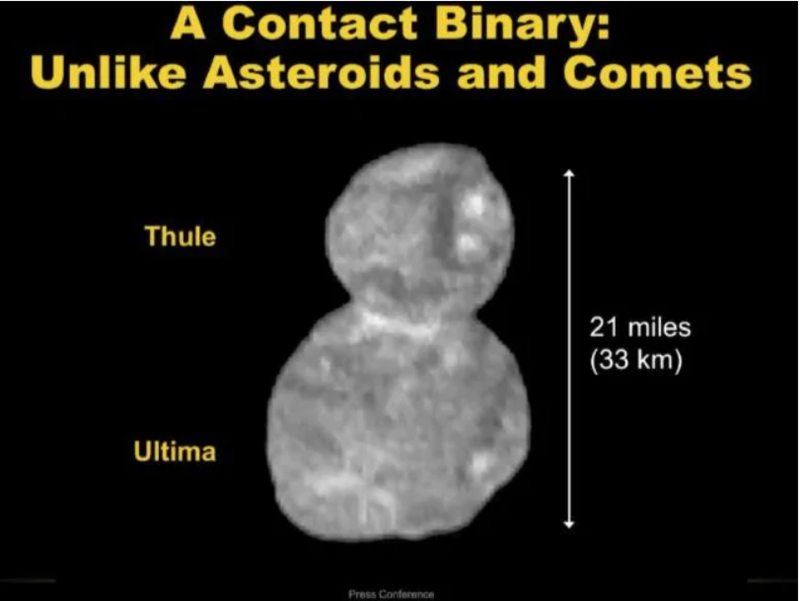 Ultima Thule is described as a “contact binary”, consisting of two connected spheres that measure about 31km in length and resembles a snowman. The smaller, head-shaped body is called Thule and the larger body of the hypothetical snowman is known as Ultima. The New Horizons space probe is exploring space with the aim of understanding “the birth of the solar system”. The team’s geology and geophysics lead Jeff Moore said the discovery of Ultima Thule will help them in their investigation. In the coming months, the New Horizons space probe will send back more data and high-resolution images from its fly-by to Ultima Thule which will help to write new chapters in its story.